A WebmasterWorld thread reports that Google has made a small change to the location where you can find your crawl rate charts. 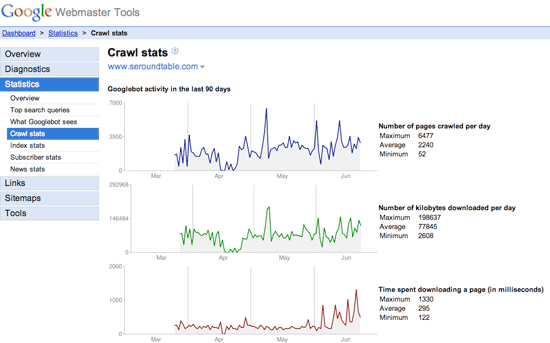 In the past, as I described on May 2nd, Google placed the crawl stats under the "Tools" and "Set crawl rate." None of us thought that was the most logical place for the chart. So Google has moved the chart into the "Statistics" section under the "crawl stats" section - which previously just had PageRank data. Under these charts, you will find the "The PageRank of your pages in Google" and "Your page with the highest PageRank" charts. (1) Google moved the crawl rate charts to the statistics section, under crawl rate, in Google Webmaster Tools. (2) Google updated the chart to show the correct month labels.